With Summer just about to start (I do wonder, given that the heater in my house kicking in this morning with as cold as it was), its time for companies like Sega and Taito to hold some “private” product meetings. I put it like that because these are special-invite only but they do allow certain press to get information and share it with the world, which is what will be discussed below. Given the content of the meetings it looks like the product will be aiming just for the Japanese market, but there might be an exception or two, such as Groove Coaster. On that note let’s go with Taito. 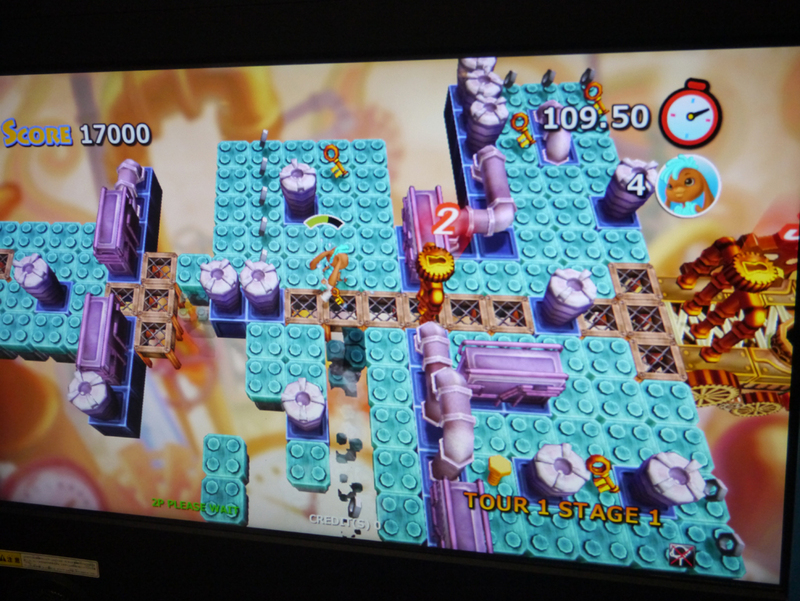 pictures below come from 4Gamer.net who covered the Taito event. They seemed to have a little less to show as far as new cabinets go but a stronger set of listings for their download network, NESiCA. 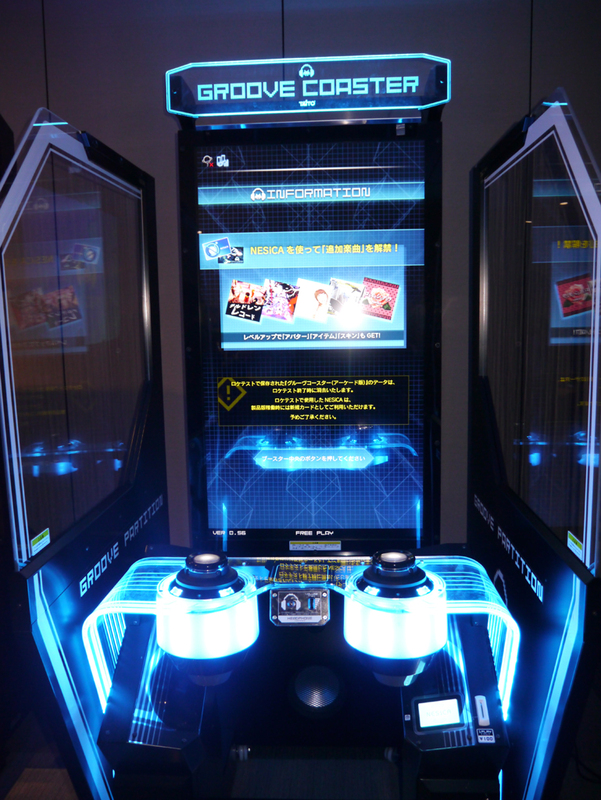 Their main attraction is Groove Coaster Arcade, same as it was at AOU13. Originally Taito had announced that the game would be released this Winter however it apparently has done so well on test that they have bumped it up to this Summer instead. There is still a good chance this game could be converted for a Western audience and tested out over here although there is no news about a Western test at this time; it is further complicated by an announcement that the game will make full use of their NESiCA system to keep the game updated. 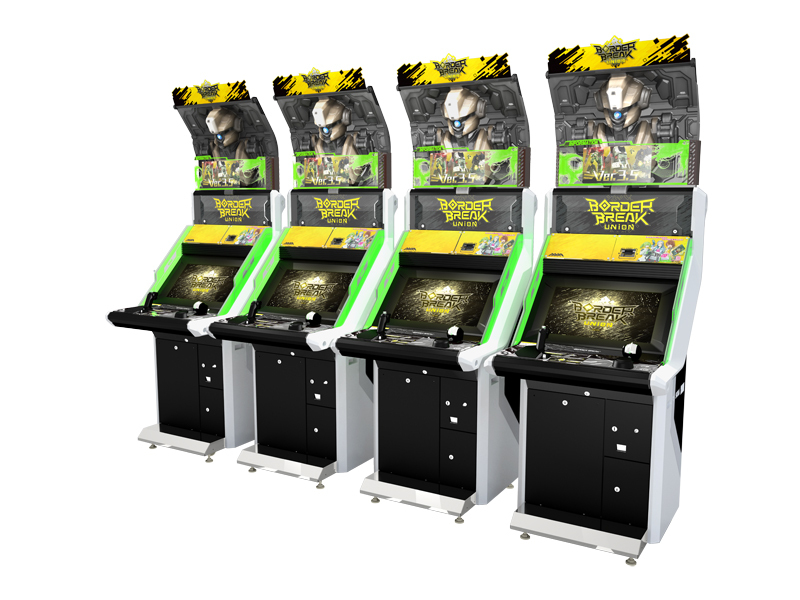 Taito so far has been reluctant to launch their network outside of Japan, although that shouldn’t mean that they cannot launch an offline version. There have been some slight changes made to the cabinet, notably the control panel which is fully backlit now. They also showed one piece with a “Groove Partition” enclosure on the sides to better channel the sound towards the user as shown in the picture below. Aside from GCA most everything else shown was for the NESiCAxLIVE network, including some of the games discussed on a post here recently such as the new version of King of Fighters XIII Climax, Spelunker, Do Not Fall and the American made Skullgirls. The latter has stirred up a bit of attention already although according to the information so far, they have not determined when the game will be launched yet. I imagine it will be put through some testing which is to be expected but getting an American made game onto the network could potentially open the floodgates for more down the road. Do Not Fall is made by Taiwanese developer XPEC so that could also have a similar effect. 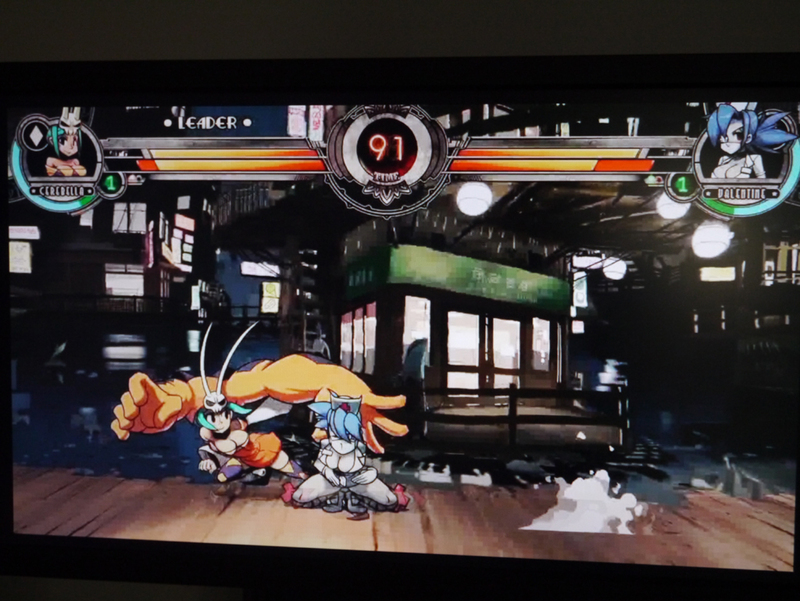 They also showed off a new version of the fighter Chaos Code and Ikaruga. 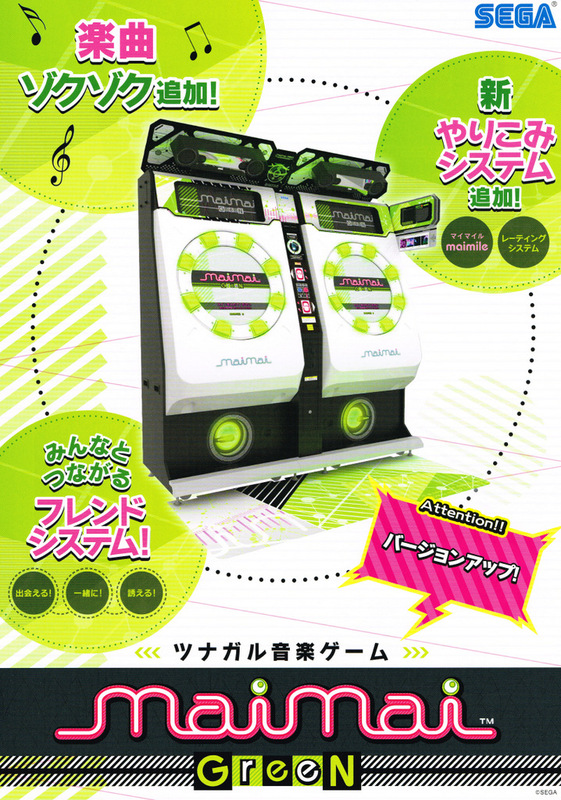 Also to be found at this Private show was an update to their rhythm game that is not Project DIVA, MaiMai Green. This adds more songs and social media features, allowing users to register friends. Also speaking of updates to existing games was an announcement for WCCF 2012-2013 (soccer/football game for the uninitiated) and Border Break Union (mech fighting game). I like the new marquees they have for BBU, kind of getting a Terminator Salvation Arcade vibe from that. Beyond that Sega’s network system for arcades, ALL.NET+ Multi was seeking attention. 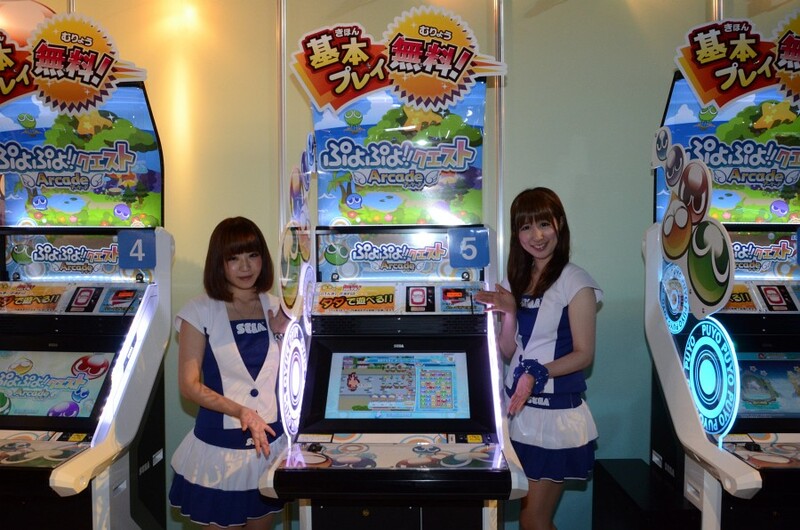 While their game selection is not as large as Taito’s NESiCA, they are working on that. The recent announcement of Guilty Gear Xrd Sign will certainly provide a boost and at this show Sega had the latest versions of Caladrius (vertical shooter by MOSS), Phantom Breaker Another Code (fighting game), Under Night In-Verse Exeter Late (another fighting game; new major update version) and Under Defeat HD+ (vertical helicopter shooter). There was a little more than that but it was mostly Japan-centric medal games and such. Just on the video side we aren’t expecting the reach on any of these games to be very wide outside Japan either, but you never know. I agree with 60Hz, That game is just what my arcade needs.